Night Safari Singapore is the well-known tourist attraction which earned a great reputation as the very first nocturnal zoo in the world. 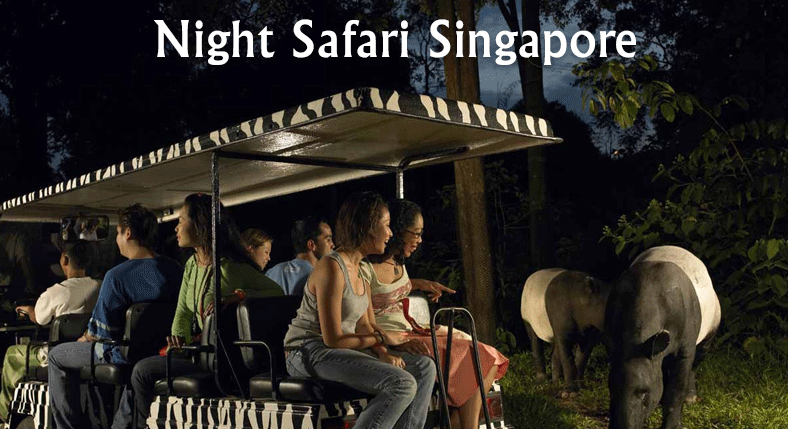 On May 26, 1994, Night Safari Singapore had its grand opening as it houses the lushly forested region of 40 hectares. These landscaped gardens have around 130 species of animals, adding up to around 1000 in total. Here, you will walk through the well-paved paths and boardwalks to visit the themed enclosures of the landscape with barriers that are almost invisible to the visitors. The moonlit setting is an ideal haven for the animals like Bharal, Himalayan Tahr, Wolves, Vultures, the Asian Rhino, sloth bear, and the striped Hyena. These animals are seen on their own habitat, completely unaware of your presence. All these sights make a memorable eye-popping experience. You can buy a multi-park pass instead of paying la carte every time if you plan to visit several Wildlife Reserves and parks in Singapore. You can buy this pass online before visiting the park and get a 5% discount extra. The visiting hours are typically shorter in the Night Safari than a theme park. In addition, both lines are also long as everyone arrives at the time of opening of the park. So, it is recommended to book tickets in advance. 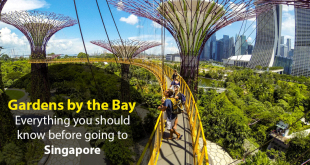 You may also book tickets from Klook, a leading seller of discounted tours and tickets in Singapore. You can also buy add-ons like transportation and meals with lowest prices for single tickets. Located in the proximity to River Safari and Singapore Zoo, Singapore Night Safari is just 30 minutes of drive from Orchard Road and Marina Bay. It is located in the secondary rainforest. Hence, it is ideal for animals to avoid natural barriers and roam freely. Getting it is also very easy by taxi or public transport. Singapore Zoo is another great attraction to enjoy your day. 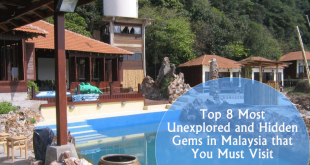 You can also enjoy River Safari and head to the Night Safari. 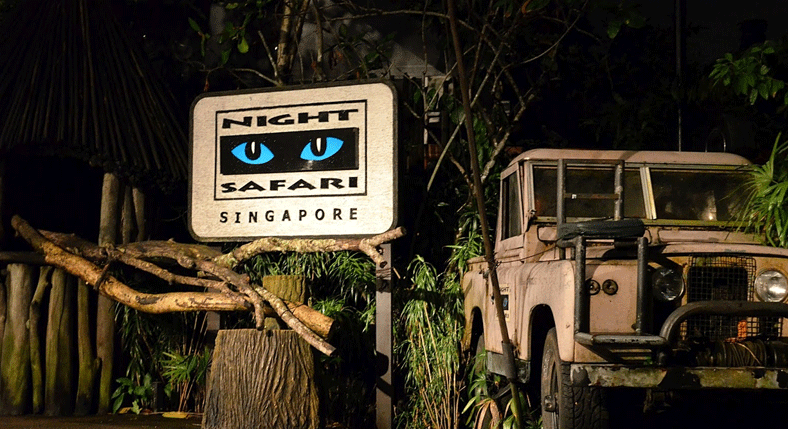 Singapore Night Safari opens from 7:15 pm in the evening till midnight. 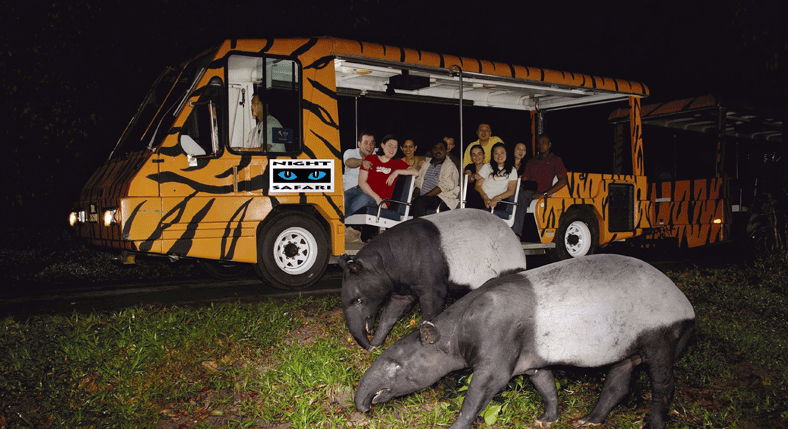 River Safari and Singapore Zoo are open till the opening time of Night Safari. You can grab a bite and rest at the fast-food restaurants during that downtime, which are located in front of the entrance of the Night Safari, which opens at 5:30 pm. The Thumbuakar Performance is another great benefit of arriving at Night Safari early, featuring various stunts and fire throwers, starting at 6:45 pm. You may wrap up your dinner, watch it and queue for entrance at 7:15 pm. You can also browse the shops which open at 5 pm in the evening. If you are with kids in Singapore and you have planned to cover two parks at once, you must go slowly. 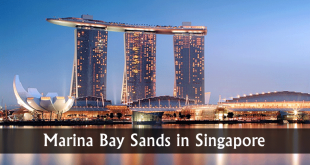 If you are not used to tropical weather in Singapore, it may be harsh. It is because the heat is quite intense in the afternoon. Unless you are a pro photographer with DSLR, proper camera equipment and knowledge in photography, forget taking pictures due to lack of proper lighting at the Night Safari. However, you might take selfies in restaurants and other well-lit areas or even at bat enclosure. Any kind of flash photography is prohibited here as it might disturb the animals. It is probably the first thing most visitors do when entering the park. You should also get in the queue for the complimentary guided tour. You can get the complete insight into the landscapes when you are on a tram. It comes handy as you can view some animals at night. Even though it looks quite long, the tram moves quickly. 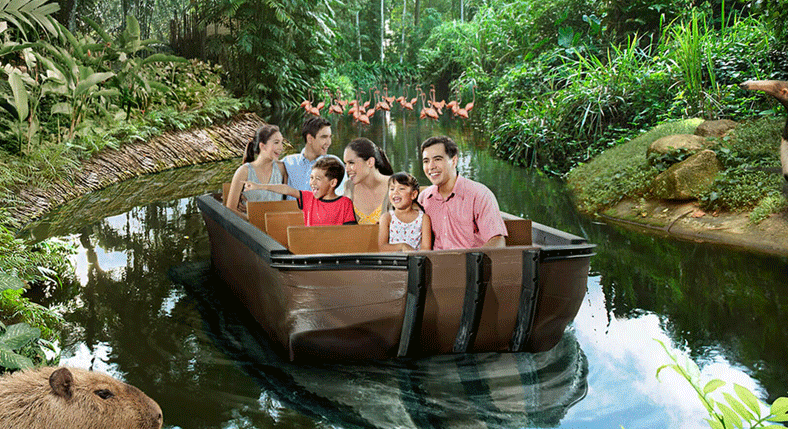 The guided ride lasts up to 40 minutes and guides the guests along seven different geographical zones in the world to get up close to the native species of all regions in the world. When there is no moon in the sky, there are specially designed lights in the exhibits which seem like moonlight to spot different animals en route. After getting a basic overview of the park, it’s time to go a bit deeper in the park. After riding the tram at 8:30 pm, you may head to Creatures of the Night show, unless you explore a few trails when kids are still awake. You can observe the behaviors of civet cats, hyenas, and others as trainers present them during the show. Be sure to arrive at least 30 minutes earlier to grab a seat before it starts. The show starts several times. So, you can catch the show later if your tram ride is yet to complete. The bats have always been a major highlight here. There are large numbers of freaky looking fruit bats. But walking in their habitat gives a unique experience. You can get up closer to the bats where only air separates you from them. You can spot bats hanging on trees or flying over your head with an inch of distance. Later on, you can spot other animals as per your interest. 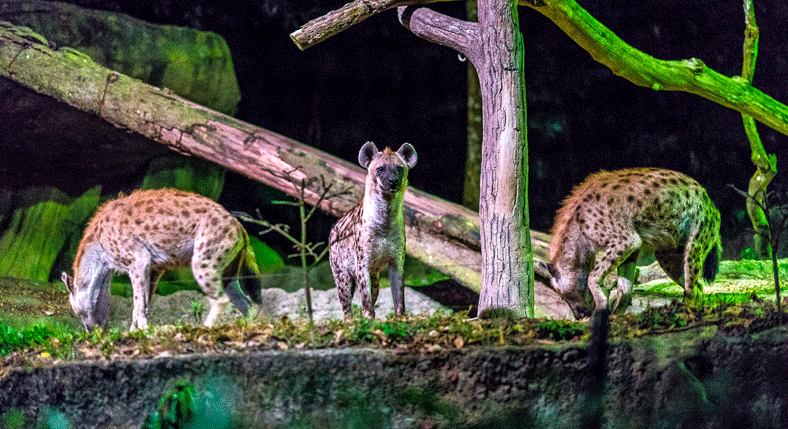 You may take a look at a Night Safari map and see where to find each of them. This show lasts 7 minutes and takes place several times every night at the exit and entrance of Night Safari. If you missed it at the beginning, you can catch it when you exit. However, the show gets interrupted and doesn’t run if it rains. Wear mosquito repellent and comfortable walking shoes. Don’t wear the open-toed shoes as some trails are uneven and it’s dark over there. Sometimes, it also rains outside. Public transportation is easily available to get there. There are plenty of taxis at the park to get back to your hotel or residence. Lockers are also available to relieve your shoulders and to keep your valuables safe.